Copyright 2010 © Barry Banham for FMHT. Engine: A. Hall & Co Ltd, Aberdeen. Boiler: Boiler by Palmers Shipbuilding & Iron Co Ltd, Hebburn on Tyne. 1.5.1930: Launched by A. Hall & Co Ltd, Aberdeen (Yd.No.628) for Bloomfield’s Ltd, Great Yarmouth as OCEAN LUX. 5.1930: Completed (Neil Mackay, manager). 28.5.1930: Registered at Yarmouth (YH84). 1930s: Fished seasonal from Padstow and Fleetwood (Bloomfields Ltd, Fleetwood, managing agents). 25.11.1933: Connected to drifter PLOUGHBOY (LT1177) disabled with broken rudder post and delivered Gt. Yarmouth. 30.11.1939: Requisitioned for war service as a minesweeper (P.No.FY.1503) (Hire rate £70.4.11d/month). 1942: Transferred to Bloomfield’s Ltd, Fleetwood management. 4.1943: Employed on miscellaneous Naval duties. 9.1945: Returned to owner. Transferred to Bloomfield’s Ltd, Gt Yarmouth. 29.10.1946: At Yarmouth landed 170 crans of herring. 17.10.1951: At Yarmouth landed 140 crans. 27.10.1953: At Yarmouth landed 270 crans. 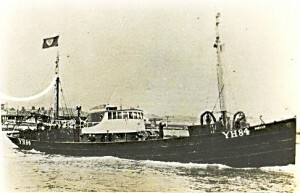 16.11.1953: At Yarmouth landed 160 crans. 21.11.1953: At Yarmouth landed 170 crans from Cap Gris Nez grounds. 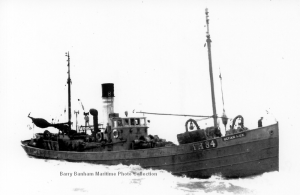 21.12.1954: Sold to W. H. Kerr (Ship Chandlers) Ltd, Milford Haven (William H. Kerr, manager). 8.3.1956: Registered at Yarmouth as DEELUX (YH84). 16.6.1956: Attended steam trawler MERCHANT VANGUARD (M56) stranded on Hook Peninsula, Co. Waterford previous day while seeking shelter. Attempted with MERCHANT VENTURER (M49)(Sk. Ernie Smith) and HOSANNA (LT167 ((Sk. A. Wiseman), to refloat the vessel but failed. 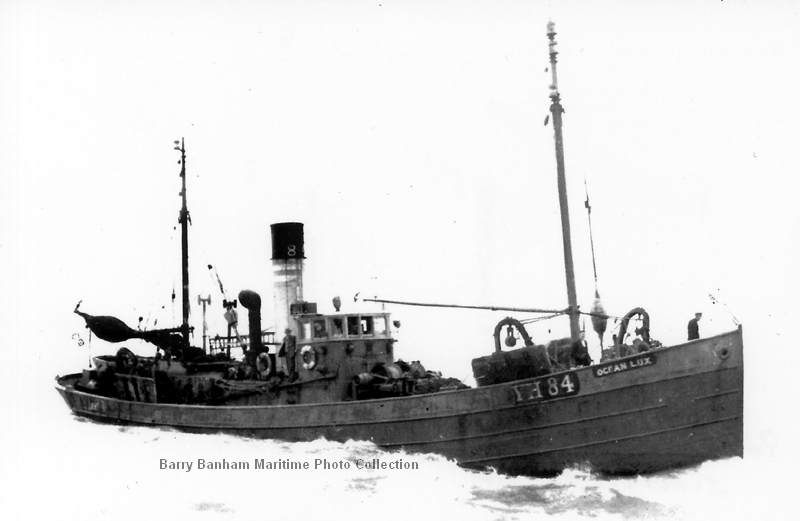 1958: Re-engined with 2 stroke 5-cyl 360bhp oil engine by Crossley Bros Ltd, Manchester at Lowestoft by Richards (Ironworks) Ltd.
12.1958: Re-registered as a motor trawler. 1975: Sold to Powell Construction Ltd, Llanblethian, nr Swansea for breaking up at Swansea. 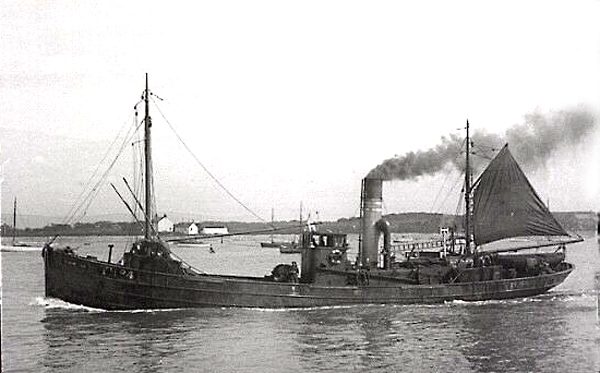 2.1975: Sailed Milford for Swansea in tow of LORD RODNEY (A50). Tow parted and recovered by Tenby lifeboat. Re-sold to Thos. 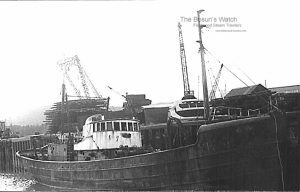 W. Ward Ltd, Sheffield for breaking up at Briton Ferry. 4.3.1975: Breaking up completed. Yarmouth registry closed. 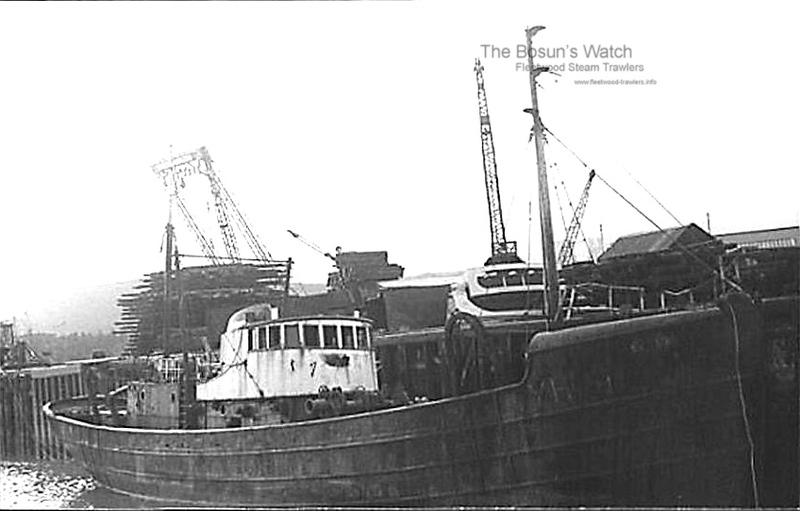 This entry was posted in Drifter/Trawler, Seasonal Visitors, Steam Trawlers, Steamers (Picture) and tagged Drifter/Trawler, No Fleetwood owners, Seasonal Visitors on May 27, 2011 by Fred Smith.